Small tree with a rounded growth habit. White blooms edged in pink, followed by small red fruits. Hardy to -30F (-34.4C); height: 25ft. Early blooming variety with large fragrant blooms. Can be used as a rootstock for other apples and is considered an excellent choice for cold climates, surviving temperatures to -50F (-45C). Small tree with single white blooms tinted with pink, follwed by small 1-1/2inch yellow-green fruits. Growth habit is wide and rounded. Bright red fall coloring. Very pretty ornamental or wildlife tree. Fruits also make wonderful jellies and james. Hardy to -20F (-28.8C0; height: 30ft. 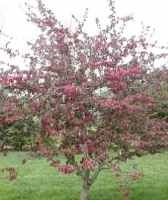 Believed to have orignated in the Tien Shen mountains, this variety is one of the finest of the ornamental crabapples, forming a large shrub or small tree with pink or deep rose colored flowers, fading to white as they mature. They are followed 1/3 inch red fruits. Good specimen tree. Hardy to -30F (-34.4C); height: 30ft. Small tree bearing deep pink blooms in the spring followed by small yellow-green fruits with a red blush. Rounded wide growth habit. Very nice ornamental. Hardy to -30F (-34.4C); height: 20ft. Glossy dark green leaves and deep pink blossoms followed by 5/8in. yellow fruits. Prized for its ornamental value. Hardy to -30F (-34.4C); height: 15ft. Upright rounded open growth habbit. New leaves are dark red turning to green. Fall color is purple/red. Flowers open dark red and turn pink. Fruit is red, 5/8in. diameter Hardy to -30F (-34.4C). Height 30 ft.
Nice ornamental crab with white spring blooms, followed by small red fruits. Doubles as wildlife food as well. 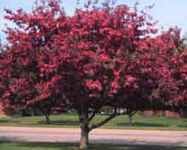 Small tree or large shrub with pink spring blooms followed by 1/4 inch red fruits. Densely branched, it makes any excellent screen or wildlife planting. Hardy to -30F (-34.4C); height: 15ft. Shrub with white blooms followed by 1/4 inch dark red fruits. Densely branched, it makes any excellent screen or wildlife planting. Hardy to -30F (-34.4C); height: 10ft. A profusion of tiny white blooms cover this pretty ornamental tree in the spring, followed by tiny yellow-green fruits. Hardy to -30F (-34.4C); height: 20ft. This variety has a unique three pointed leaf. White spring blooms followed by small green fruits blushed with red. Hardy to -30F (-34.4C); height: 25ft. Popular new disease resistant variety with reddish-purple buds and blooms followed by 1/2in. deep purple fruits. Bark is an attractive red and the leaves emerge, first as maroon, then turn dark green. Fall foliage is red-purple. Beautiful specimen or landscaping tree. Hardy to -30F (-34.4C); height: 20ft. Large white blooms in spring followed by bright red 1 1/2 inch fruit, excellent for jellies and preserves. Rounded growth habbit with semi-weeping branches. Hardy to -50F (-45C); height: 30ft. One of the prettiest of the new cultivars with an upright spreading growth habit with red buds which open to make the tree a mass of purple bloom with lighter pink centers. Leaves are purple, fading in to bronze in the autumn. Fruits are 1/2 in. in diameter and deep burgundy in color. Hardy to -30F (-34.4C); height: 20ft. Deep red buds open to dark pink blooms followed by small red fruits. New leaves are reddish-purple. Hardy to -40F (-40C); height: 20ft. Masses of white flowers are followed by bright red fruit that persists into winter. Semi-weeping. Hardy to -30F (-34.4C); height: 10ft. Bright pink spring blooms age to cream-pink with deep pink color remaining on the margins. Deeply lobed foliage is dark purple and the tree forms a dense rounded canopy. Fall color is a bright red-orange with maroon red fruit Hardy to -30F (-34.4C); height: 20ft. Smaller version of 'Sargent' excellent for patio or deck planting. Single red buds open to fragrant white flowers. Produces ¼" diameter bright red fruit. Dense spreading-branching habit. Exceptional disease resistance. Hardy to -30F (-34.4C); height: 8ft. Vigorous tree with msses of pink buds opening to white flowers. Small showy orange-red fruit. Hardy to -30F (-34.4C); height: 15ft. Smowy white spring blooms and bright gree foliage. A fruitless variety. Heat tolerant. Hardy to -30F (-34.4C); height: 15ft. Upright oval growth habit with pink buds and bright white blooms, followed by bright red fruit. Crisp green foliage. 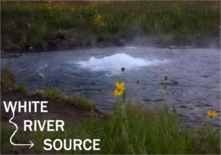 Disease resistant. Hardy to -30F (-34.4C); height: 20ft. Upright rounded tree with delicate pink blooms and deep purple foilage that turns yellow/orange in the fall. Produces dark red 1 1/2 inch fruit. Resistant to fireblight and mildew. Hardy to -40F (-40C); height: 20ft.